At ISSE/Long Beach on January 25-27 at the Long Beach Convention Center, the traffic was brisk and many colorists stopped by the company’s beautiful exhibit – double the size of last years – to “Discover STRANDS … and Ignite Your Color Passion”. 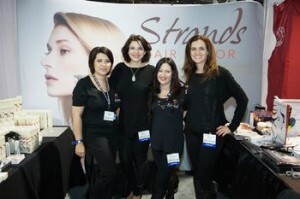 They had the opportunity to meet with STRANDS Founder and CEO Mirela Marinescu and Marketing Director Karina Rizvanbegovic and check out the money-saving show promotions. Mirela said, “We got to hear from many more colorists this year why they are LOVING our 60-shade permanent and ammonia-free cream color line. Of course the Argan Oil and Keratin for vibrant color, incredible shine and lasting coverage were the stars”. Strands has extended its special show pricing promotion on both the REFLEXIONS™ low-ammonia color (33 shades) and COLOR LUST™ ammonia-free formula (27 shades) through March and you can find that right here.